The ahupuaʻa of Hakipuʻu (Broken Hill – referring to the jagged ridge top) is located at the northern end of Kāne’ohe Bay, between Kualoa and Waikāne. Paliuli (green cliff,) a “legendary paradise of plenty” with many proclaimed sites throughout the islands, was said to have existed in the mauka regions of Hakipuʻu. Handy described the taro flats at Hakipuʻu, originally more than one-half mile south from Moliʻi Fishpond, where all the level land along Hakipuʻu Stream was once in terraces. Based on the estimated rates of population decline due to the introduction of European disease, Hakipuʻu would have had a population of about 300 at the time of ‘contact’ in 1778, decreasing to about 225 by 1800. In the first formal census in 1832 the population of Hakipuʻu had declined to 180. Later, in Hakipuʻu, “fields were fenced and plowed for the cane, small flumes were put up and Chinese coolies imported for laborers”; by 1867, however, it became evident that the land was poor for sugarcane and it was abandoned. The land was later used for rice cultivation (1860s,) then pineapple. However, by 1923, it was evident that pineapple cultivation on the Windward area could not keep up with that in other O‘ahu areas. Much of the land was converted to pasture for cattle ranching. Some of the Hakipuʻu land remains part of the Kualoa Ranch. Harbor defenses had constituted the primary element of the means employed by the Army for seacoast defense. Harbor defenses consisted of permanently installed guns of various calibers, which could be supplemented in an emergency by mobile coast artillery guns and controlled mine fields. Following World War I and until the end of World War II, additional coastal armaments were constructed. Then, the Army mission was “the defense of Pearl Harbor Naval Base against damage from naval or aerial bombardment or by enemy sympathizers and attack by enemy expeditionary force or forces, supported or unsupported by an enemy fleet or fleets”. Batteries at Fort Kamehameha, Fort Weaver and Fort Barrette (the latter two constructed in 1924 & 1935) completed pre-World War II coastal defense network for Pearl Harbor. Batteries at Fort DeRussy and Fort Ruger were responsible for the defense of the South coast and Honolulu Harbor. While none of the large caliber guns were ever fired except in practice, the secondary anti-aircraft guns of coastal artillery units at Fort Kamehameha were credited with shooting down a number of attacking aircraft on the morning of December 7, 1941. Following the Pearl Harbor attack, as part of the growing Coast Defense network, numerous Batteries and their associated Fire Control Stations were set up around the Islands. A Fire Control Station is an observation and command center used to direct fire from gun Batteries on the coast. Fire Control personnel spot and determine where the guns should aim (typically working with others using triangulation;) Batteries have the guns to fire at the targets. In 1917, Waimanalo Military Reservation was created (later renamed to Bellows Field in 1933;) with the outbreak of WWII, Bellows was transformed almost overnight into an important facility where aircraft were prepared for their duty in the Pacific Theater. Part of the defense of the facility was Battery Wailea, located at Wailea Point (at the dividing line between Waimanalo and Lanikai.) Search lights were emplaced at the Battery. The Battery was operational from 1942 to 1945. Pedestals in the bunkers were mounts for high-powered optical instruments for determining azimuth and range of ocean vessels. The troops manning the site slept and lived in tents in shifts on the slopes. Water and power lines were brought up from below to serve the bunkers and tent quarters from the Lanikai side of the Kaʻiwa Ridge. 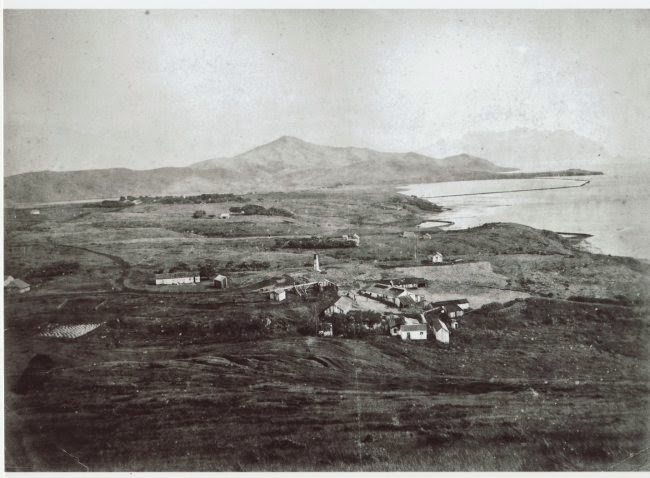 The Podmore stations were located in the South Sector of Oʻahu’s two defense sectors, and tactically assigned to the Harbor Defenses of Kāneʻohe Bay located in a tunnel system dug into Ulupaʻu Crater on Mōkapu Peninsula. Today, a hiking trail takes you to the Fire Control Station. Most folks call the Podmore Fire Control bunker the Lanikai Pillboxes; a misnomer. As noted, the bunkers were built as an observation and command center for Battery Wailea and observation for Bellows Field. A pillbox is a reinforced guard post, normally equipped with openings through which to fire weapons. The Podmore Fire Control Station was for observation, not weaponry. The land was leased from Waimanalo Sugar Plantation. It was used as the bivouac area and a target practice area by the Coastal Artillery, which strung a line of 90-mm guns along the beach. During the 1930s, Bellows was used as a bombing and gunnery range by aircraft from Luke (Ford Island,) Wheeler and Hickam Fields. Back then, the field was nothing but overgrowth of sugar cane and guava. The only clearings were for training areas and tents where the men slept. It was a training area for the infantry, coast artillery and Air Corps. There was a wooden traffic control tower and a single asphalt runway, 983-feet long and 75-feet wide. Bellows Field was used for training both air and ground forces. During the mid-1930s the Air Corps chiefly used this area for a strafing and bombing practice site. Those operations extended into 1938, when the total Air Corps personnel on duty only consisted of five to ten men supplied from Wheeler Field. Bellows was a sub-post of Wheeler Field until July 22, 1941 when it became a separate permanent military post under the jurisdiction of the Commanding General, Hawaiian Department. Overnight, an accelerated construction program began and Bellows began to grow. Two-story wooden barracks and a new and larger runway started filling the landscape. Two military members were killed (Lt. Hans Christenson and Lt. George Whiteman) and six wounded at Bellows. They included three pilots of the 44th Pursuit Squadron who were at Bellows for gunnery training and attempted to take off in their P-40s. One of the pilots had to swim to shore when his badly damaged aircraft crashed into the ocean. With the outbreak of war, Bellows was transformed almost overnight into an important facility where aircraft were prepared for their duty in the Pacific Theater. Hundreds of men and aircraft flowed through Bellows requiring more runways and facilities. Five runways, the longest 6,290-feet, were in two different airfields, connected by a taxiway – they were identified as “Bellows Field (Army)” to the south and “Bellows Field Bombing Range (Emergency)” to the north. The south Bellows airfield may have been used for some time during the 1950s as a civilian airfield of some type. 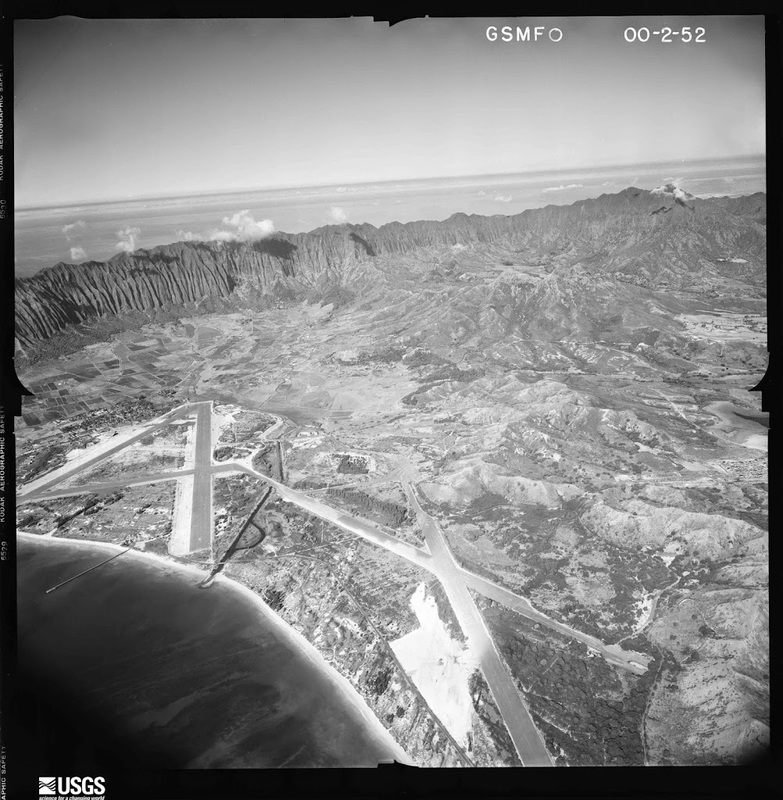 The runways at Bellows were eventually closed in 1958 and the base was used for other purposes. In 1960, the U.S. Army built two Nike-Hercules anti-aircraft missile sites at Bellows, which were operated full-time by the Hawaiʻi Army National Guard for the aerial defense of Hawaii until inactivated in 1970. The communications transmitter facility replaced the Kipapa area transmitter and receiver sites. This communications network was one of the reasons the runways at Bellows went out of use; an antenna was located right in one of the runways. In addition, a large communication building was constructed right in the middle of the crossed runways. The Bellows property was renamed Bellows Air Force Station (AFS) in 1968. In 1970 the US Air Force offered part of Bellows to the State of Hawaiʻi for use as a general aviation airport, but opposition by the nearby Waimanalo community was so strong that the state had to decline. In 1999, the Marine Corps acquired about 1,050-acres for the Marine Corps Training Area Bellows (MCTAB;) it’s now part of Marine Corps Base Hawaiʻi, headquartered in Kāneʻohe Bay. MCTAB adds significant training capabilities and maneuver space for non-live fire military training activities. The Marines and other services use the training areas to conduct amphibious, helicopter and motorized exercises in conjunction with troop land maneuver training. It is currently the only place in Hawaiʻi where amphibious landings can transition directly into maneuver training areas for realistic military training. The Air Force’s property at Bellows is now limited to the recreational facilities. The Bellows Recreation Center is composed of 102 beach cottages, a small exchange & a beach club. Bellows is still depicted as an abandoned airfield on recent Sectional Charts. The facility also serves as all-service beach-front recreational area for active-duty and retired military personnel, civilian employees of the Department of Defense, dependents and guests. Dr Theodore Richards’ first position in Hawaiʻi was teacher of the first class to graduate from the Kamehameha Schools and also as an instructor of music and athletic coach. He served as principal of the Kamehameha Schools for five years (replacing William Oleson, Kamehameha’s 1st principal.) Richards married Mary C Atherton in Honolulu, June 29, 1892. They had four children, Ruth (Mrs Frank E Midkiff,) Joseph Atherton, Herbert M and Mary Theodora Richards. In 1927, Richards envisioned a community center and camp ground where people of all races could come together as “one blood” or “kokokahi”. Initially, the Richards’ camp started on Moku O Loʻe (Coconut Island.) Chris Holmes, Fleishman Yeast heir, offered to buy the Bishop Estate lease from the camp and to take over the island as a private residence. 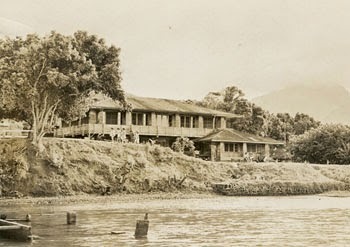 Camp Halekipa was established and later merged with Theodore Richards’ combined conference, camp and vacation home area for all Christians, and called Kokokahi as part of the YWCA. In a time when it was the custom for communities to be segregated by race, Kokokahi was an unprecedented effort to breakdown racial barriers. The YWCA national commitment to eliminating racism is in close harmony with Dr Richard’s. The new camp offered conferences and camp outings for such diverse organizations as church groups, the University of Hawaiʻi sororities, the Salvation Army and Home Demonstration Clubs. In 1936, the Juliette Atherton Trust built Atherton Hall on the YWCA property. It overlooks Kāneʻohe Bay, with floor to ceiling glass doors and a lanai that wraps around the building. Today, Atherton Hall is used for group retreats or meetings, as well as a site for weddings; it has a full catering kitchen. Hale Nanea Lodge and nearby island-style cottages provide sleeping quarters for overflow. Hale Nanea Lodge is a modern style lodge that can accommodate up to 60-guests in five dorm style rooms (with 12-camp-style single bunk beds per room.) Hale Nanea is equipped with its own kitchen, meeting space and men’s and women’s restrooms. Originally built in 1933, nearby cottages have camp-style single beds and bunk beds and share a common area restroom with showers. The cottages have electricity and an outdoor picnic area with barbeque grills and sink. During WWII, Kokokahi was used as a rest camp by the military. In 1968, renovations were begun to include a physical education building for indoor classes, an arts and crafts facility, a large multipurpose building and a marina. Fully renovated in 2001, Midkiff Gymnasium is a modern multi-purpose gym. The unique sliding doors create an open air area, allowing ocean and mountain views. The gym has a sports floor covering and a college regulation size basketball court. Today, Kokokahi offers YWCA members a place to participate in cultural, educational and recreational activities together. The camp recently completed another renovation, getting a much-needed face-lift. The image shows Kokokahi and the Atherton Home (Hall.) In addition, I have added other related images in a folder of like name in the Photos section on my Facebook and Google+ pages.